The big story out last month was in the area of Montereggi, an Etruscan site. There is plenty of information at La Repubblica, Nove da Firenze, and Archeorivista, as well as some brief English-language coverage (The Florentine). Montereggi has been excavated for seven years, with the last phase ending in October of 2011. 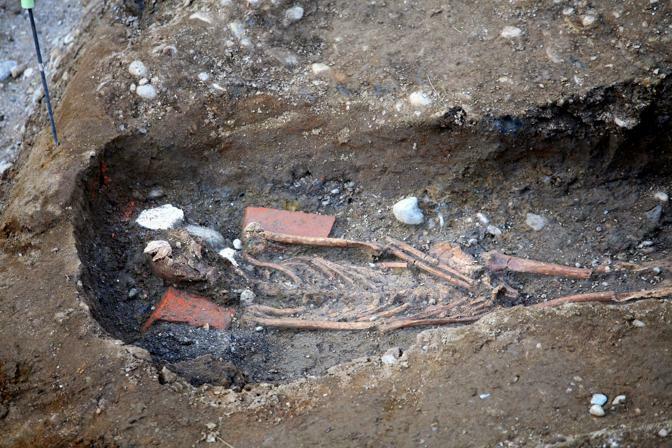 This past year, excavators found a human skeleton in a well. 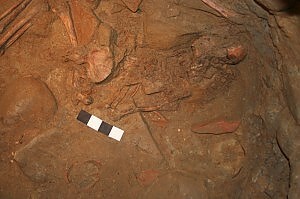 The skeleton was found on top of a number of waterproof jars that seem to have contained wine (although further testing will determine this for sure), then covered with other fragmented jars. The excavators think it was a purposeful burial (not that, for example, someone fell into the well or was thrown in), but analysis of the skeleton is ongoing at the Archaeological Superintendency of Tuscany. 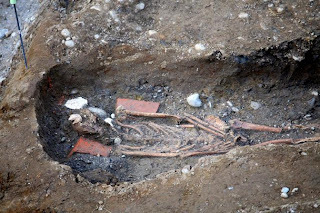 Two cremated bodies were found in Cawston (near Norfolk, UK) dating to the Roman period. Not a lot of additional information on them, though. Did an Italian archaeologist find the tomb of St. Philip the Apostle, who was martyred in 80 AD, in Hierapolis (Turkey)? He's certainly suggesting that the Roman-style tomb was indeed that of Philip, but this is the only coverage I saw. 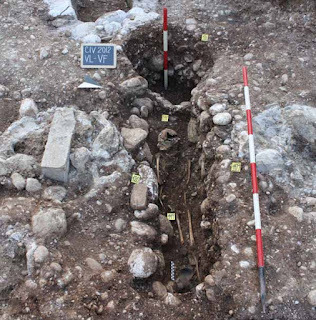 A Roman cemetery was discovered in Djerba, Tunisia. There are apparently over 100 graves, but no additional information has been released yet. Djerba may have been the island of the lotus-eaters referred to in the Odyssey and, in Roman times, produced a lot of murex dye. This could be a very cool site, especially if they have skeletons from those graves. I hope more information comes out soon. And now for a bit of crowd-sourced archaeology... If you live in Kingsholm, Gloucester (UK), you might want to dig up your garden and see what you find - the area used to be a Roman military fort. Excavations are resuming at the Etruscan site of Populonia this summer, including its necropolis. Should be some interesting news coming out of this dig. A new archaeological project seeks to answer the question "What have the Romans ever done for us?" - with the "us" being the Irish. The project will tackle Late Iron Age and Roman Ireland. Previous work has already been done on human remains (including isotope analyses), but this project will find additional sites and try to figure out what it meant to be "Roman" in Ireland. This could be quite interesting, as it's likely that Roman influence in Ireland was different than Roman influence in Britain and this difference hasn't been thoroughly researched yet. The Roman gladiator skeletons are on tour, spending some time in Durham (UK). If you need a reminder about who the Roman gladiators are, I covered one of the publications here ("Headless Romans of York"), but it was all over the media back in 2010: National Geographic, CNN, Telegraph. A recent blog post about a uterus votive in the Wellcome collection inspired me to write about anatomical votives in antiquity. I also wrote about the history of bioarchaeology in Italy, which was drawn in large part from my master's thesis research. And my post on Lead Poisoning in Rome: the Skeletal Evidence was syndicated over at Past Horizons. So go check it out if you haven't already. Just wanted to call attention to a blog by Italian anthropologist Moreno Tiziani, who also wrote a book with the same title: Professione Antropologo (Professional Bioanthropologist). Join me next month for more news from the world of Roman bioarchaeology!